Like terrestrial biomes, aquatic biomes are influenced by a series of abiotic factors. The aquatic medium—water— has different physical and chemical properties than air. Even if the water in a pond or other body of water is perfectly clear (there are no suspended particles), water still absorbs light. As one descends into a deep body of water, there will eventually be a depth which the sunlight cannot reach. While there are some abiotic and biotic factors in a terrestrial ecosystem that might obscure light (like fog, dust, or insect swarms), usually these are not permanent features of the environment. The importance of light in aquatic biomes is central to the communities of organisms found in both freshwater and marine ecosystems. In freshwater systems, stratification due to differences in density is perhaps the most critical abiotic factor and is related to the energy aspects of light. The thermal properties of water (rates of heating and cooling) are significant to the function of marine systems and have major impacts on global climate and weather patterns. Marine systems are also influenced by large-scale physical water movements, such as currents; these are less important in most freshwater lakes. Figure 1. The ocean is divided into different zones based on water depth and distance from the shoreline. The ocean is categorized by several areas or zones (Figure 1). All of the ocean’s open water is referred to as the pelagic zone. The benthic zone extends along the ocean bottom from the shoreline to the deepest parts of the ocean floor. Within the pelagic realm is the photic zone, which is the portion of the ocean that light can penetrate (approximately 200 m or 650 ft). At depths greater than 200 m, light cannot penetrate; thus, this is referred to as the aphotic zone. The majority of the ocean is aphotic and lacks sufficient light for photosynthesis. The deepest part of the ocean, the Challenger Deep (in the Mariana Trench, located in the western Pacific Ocean), is about 11,000 m (about 6.8 mi) deep. To give some perspective on the depth of this trench, the ocean is, on average, 4267 m. These zones are relevant to freshwater lakes as well. The physical diversity of the ocean is a significant influence on plants, animals, and other organisms. The ocean is categorized into different zones based on how far light reaches into the water. Each zone has a distinct group of species adapted to the biotic and abiotic conditions particular to that zone. The intertidal zone, which is the zone between high and low tide, is the oceanic region that is closest to land (Figure 2). Generally, most people think of this portion of the ocean as a sandy beach. In some cases, the intertidal zone is indeed a sandy beach, but it can also be rocky or muddy. 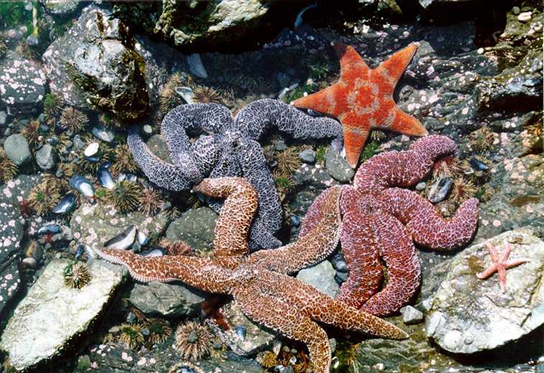 Organisms are exposed to air and sunlight at low tide and are underwater most of the time, especially during high tide. Therefore, living things that thrive in the intertidal zone are adapted to being dry for long periods of time. The shore of the intertidal zone is also repeatedly struck by waves, and the organisms found there are adapted to withstand damage from the pounding action of the waves (Figure 2). The exoskeletons of shoreline crustaceans (such as the shore crab, Carcinus maenas) are tough and protect them from desiccation (drying out) and wave damage. Another consequence of the pounding waves is that few algae and plants establish themselves in the constantly moving rocks, sand, or mud. 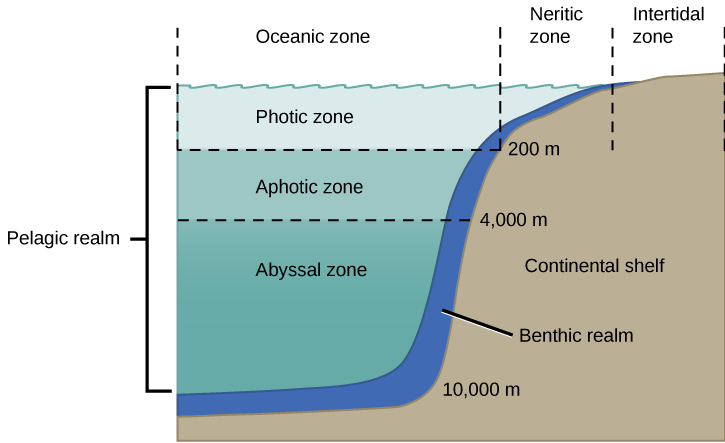 The neritic zone (Figure 1) extends from the intertidal zone to depths of about 200 m (or 650 ft) at the edge of the continental shelf. Because light can penetrate this depth, photosynthesis can occur. The water here contains silt and is well-oxygenated, low in pressure, and stable in temperature. Phytoplankton and floating Sargassum (a type of free-floating marine seaweed) provide a habitat for some sea life found in the neritic zone. Zooplankton, protists, small fishes, and shrimp are found in the neritic zone and are the base of the food chain for most of the world’s fisheries. Beyond the neritic zone is the open ocean area known as the oceanic zone (Figure 1). Within the oceanic zone there is thermal stratification where warm and cold waters mix because of ocean currents. Abundant plankton serve as the base of the food chain for larger animals such as whales and dolphins. Nutrients are scarce and this is a relatively less productive part of the marine biome. When photosynthetic organisms and the protists and animals that feed on them die, their bodies fall to the bottom of the ocean where they remain. The majority of organisms in the aphotic zone include sea cucumbers (phylum Echinodermata) and other organisms that survive on the nutrients contained in the dead bodies of organisms in the photic zone. The deepest part of the ocean is the abyssal zone, which is at depths of 4000 m or greater. The abyssal zone (Figure 1) is very cold and has very high pressure, high oxygen content, and low nutrient content. There are a variety of invertebrates and fishes found in this zone, but the abyssal zone does not have plants because of the lack of light. Cracks in the Earth’s crust called hydrothermal vents are found primarily in the abyssal zone. Around these vents chemosynthetic bacteria utilize the hydrogen sulfide and other minerals emitted as an energy source and serve as the base of the food chain found in the abyssal zone. Beneath the water is the benthic zone (Figure 1), which is comprised of sand, silt, and dead organisms. This is a nutrient-rich portion of the ocean because of the dead organisms that fall from the upper layers of the ocean. Because of this high level of nutrients, a diversity of sponges, sea anemones, marine worms, sea stars, fishes, and bacteria exist. Coral reefs are characterized by high biodiversity and the structures created by invertebrates that live in warm, shallow waters within the photic zone of the ocean. They are mostly found within 30 degrees north and south of the equator. The Great Barrier Reef is a well-known reef system located several miles off the northeastern coast of Australia. The coral organisms (members of phylum Cnidaria) are colonies of saltwater polyps that secrete a calcium carbonate skeleton. These calcium-rich skeletons slowly accumulate, forming the underwater reef (Figure 3). Corals found in shallower waters (at a depth of approximately 60 m or about 200 ft) have a mutualistic relationship with photosynthetic unicellular algae. The relationship provides corals with the majority of the nutrition and the energy they require. The waters in which these corals live are nutritionally poor and, without this mutualism, it would not be possible for large corals to grow. Some corals living in deeper and colder water do not have a mutualistic relationship with algae; these corals attain energy and nutrients using stinging cells on their tentacles to capture prey. It is estimated that more than 4,000 fish species inhabit coral reefs. These fishes can feed on coral, other invertebrates, or the seaweed and algae that are associated with the coral. 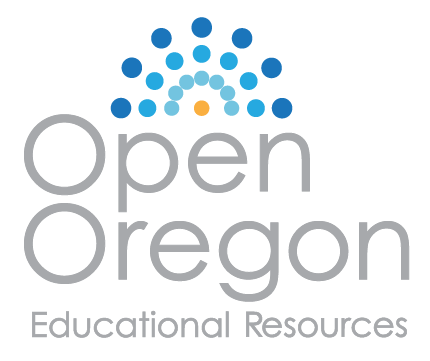 Link to Learning: Watch this National Oceanic and Atmospheric Administration (NOAA) video to see marine ecologist Dr. Peter Etnoyer discusses his research on coral organisms. It takes a long time to build a coral reef. The animals that create coral reefs have evolved over millions of years, continuing to slowly deposit the calcium carbonate that forms their characteristic ocean homes. Bathed in warm tropical waters, the coral animals and their symbiotic algal partners evolved to survive at the upper limit of ocean water temperature. Together, climate change and human activity pose dual threats to the long-term survival of the world’s coral reefs. As global warming due to fossil fuel emissions raises ocean temperatures, coral reefs are suffering. The excessive warmth causes the reefs to expel their symbiotic, food-producing algae, resulting in a phenomenon known as bleaching. 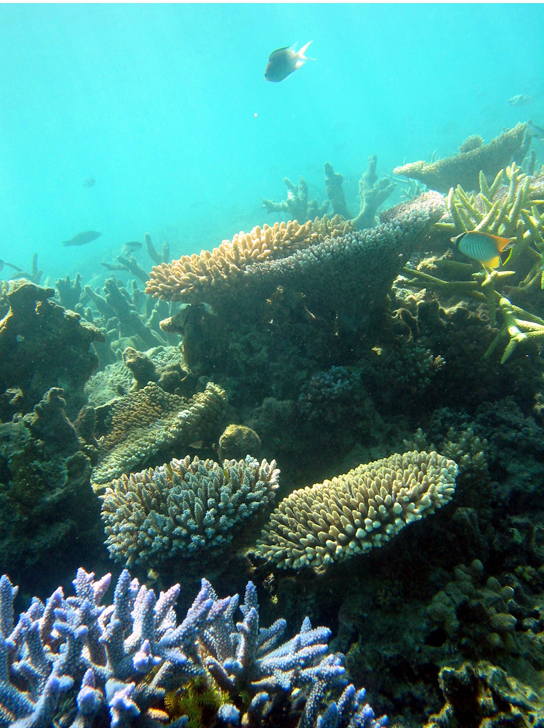 When bleaching occurs, the reefs lose much of their characteristic color as the algae and the coral animals die if loss of the symbiotic zooxanthellae is prolonged. Rising levels of atmospheric carbon dioxide further threaten the corals in other ways; as CO2dissolves in ocean waters, it lowers the pH and increases ocean acidity. As acidity increases, it interferes with the calcification that normally occurs as coral animals build their calcium carbonate homes. When a coral reef begins to die, species diversity plummets as animals lose food and shelter. Coral reefs are also economically important tourist destinations, so the decline of coral reefs poses a serious threat to coastal economies. Human population growth has damaged corals in other ways, too. As human coastal populations increase, the runoff of sediment and agricultural chemicals has increased, too, causing some of the once-clear tropical waters to become cloudy. At the same time, overfishing of popular fish species has allowed the predator species that eat corals to go unchecked. Although a rise in global temperatures of 1–2˚C (a conservative scientific projection) in the coming decades may not seem large, it is very significant to this biome. When change occurs rapidly, species can become extinct before evolution leads to new adaptations. Many scientists believe that global warming, with its rapid (in terms of evolutionary time) and inexorable increases in temperature, is tipping the balance beyond the point at which many of the world’s coral reefs can recover. Freshwater biomes include lakes and ponds (standing water) as well as rivers and streams (flowing water). They also include wetlands, which will be discussed later. Humans rely on freshwater biomes to provide aquatic resources for drinking water, crop irrigation, sanitation, and industry. These various roles and human benefits are referred to as ecosystem services. Lakes and ponds are found in terrestrial landscapes and are, therefore, connected with abiotic and biotic factors influencing these terrestrial biomes. Lakes and ponds can range in area from a few square meters to thousands of square kilometers. Temperature is an important abiotic factor affecting living things found in lakes and ponds. In the summer, thermal stratification of lakes and ponds occurs when the upper layer of water is warmed by the sun and does not mix with deeper, cooler water. Light can penetrate within the photic zone of the lake or pond. Phytoplankton (small photosynthetic organisms such as algae and cyanobacteria that float in the water) are found here and carry out photosynthesis, providing the base of the food web of lakes and ponds. Zooplankton (very small animals that float in the water), such as rotifers and small crustaceans, consume these phytoplankton. At the bottom of lakes and ponds, bacteria in the aphotic zone break down dead organisms that sink to the bottom. Nitrogen and phosphorus are important limiting nutrients in lakes and ponds. Because of this, they are determining factors in the amount of phytoplankton growth in lakes and ponds. When there is a large input of nitrogen and phosphorus (from sewage and runoff from fertilized lawns and farms, for example), the growth of algae skyrockets, resulting in a large accumulation of algae called an algal bloom. Algal blooms (Figure 4) can become so extensive that they reduce light penetration in water. As a result, the lake or pond becomes aphotic and photosynthetic plants rooted in the lake bottom cannot survive. When the algae die and decompose, severe oxygen depletion of the water occurs. Fishes and other organisms that require oxygen are then more likely to die, and resulting dead zones are found across the globe. Lake Erie and the Gulf of Mexico represent freshwater and marine habitats where phosphorus control and storm water runoff pose significant environmental challenges. Rivers and streams are continuously moving bodies of water that carry large amounts of water from the source, or headwater, to a lake or ocean. The largest rivers include the Nile River in Africa, the Amazon River in South America, and the Mississippi River in North America. Abiotic features of rivers and streams vary along the length of the river or stream. Streams begin at a point of origin referred to as source water. The source water is usually cold, low in nutrients, and clear. The channel (the width of the river or stream) is narrower than at any other place along the length of the river or stream. Because of this, the current is often faster here than at any other point of the river or stream. The fast-moving water results in minimal silt accumulation at the bottom of the river or stream, therefore the water is clear. Photosynthesis here is mostly attributed to algae that are growing on rocks; the swift current inhibits the growth of phytoplankton. An additional input of energy can come from leaves or other organic material that falls into the river or stream from trees and other plants that border the water. When the leaves decompose, the organic material and nutrients in the leaves are returned to the water. Plants and animals have adapted to this fast-moving water. For instance, leeches (phylum Annelida) have elongated bodies and suckers on both ends. These suckers attach to the substrate, keeping the leech anchored in place. Freshwater trout species (phylum Chordata) are an important predator in these fast-moving rivers and streams. As the river or stream flows away from the source, the width of the channel gradually widens and the current slows. This slow-moving water, caused by the gradient decrease and the volume increase as tributaries unite, has more sedimentation. Phytoplankton can also be suspended in slow-moving water. Therefore, the water will not be as clear as it is near the source. The water is also warmer. Worms (phylum Annelida) and insects (phylum Arthropoda) can be found burrowing into the mud. The higher order predator vertebrates (phylum Chordata) include waterfowl, frogs, and fishes. These predators must find food in these slow moving, sometimes murky, waters and, unlike the trout in the waters at the source, these vertebrates may not be able to use vision as their primary sense to find food. Instead, they are more likely to use taste or chemical cues to find prey. Wetlands are environments in which the soil is either permanently or periodically saturated with water. 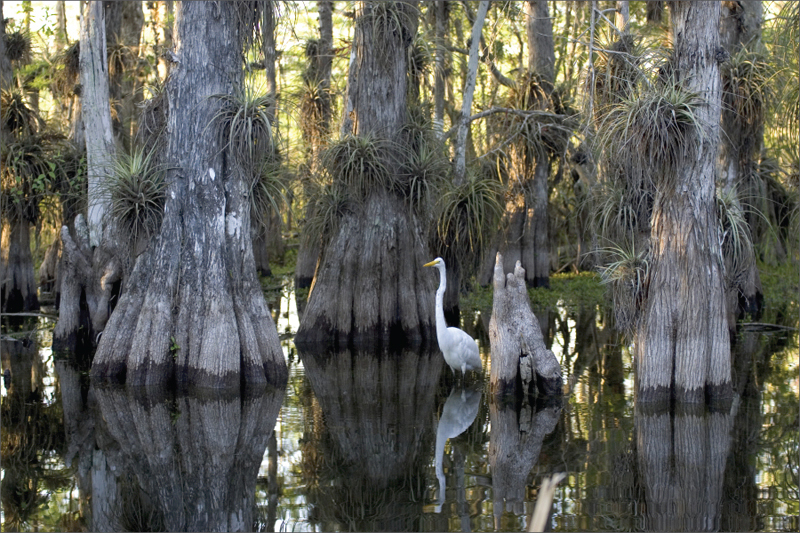 Wetlands are different from lakes because wetlands are shallow bodies of water that may periodically dry out. Emergent vegetation consists of wetland plants that are rooted in the soil but have portions of leaves, stems, and flowers extending above the water’s surface. 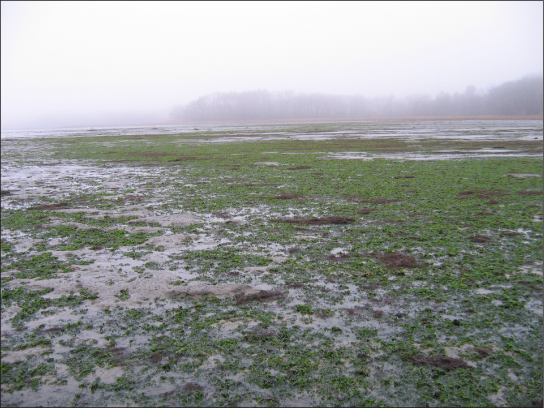 There are several types of wetlands including marshes, swamps, bogs, mudflats, and salt marshes (Figure 5). 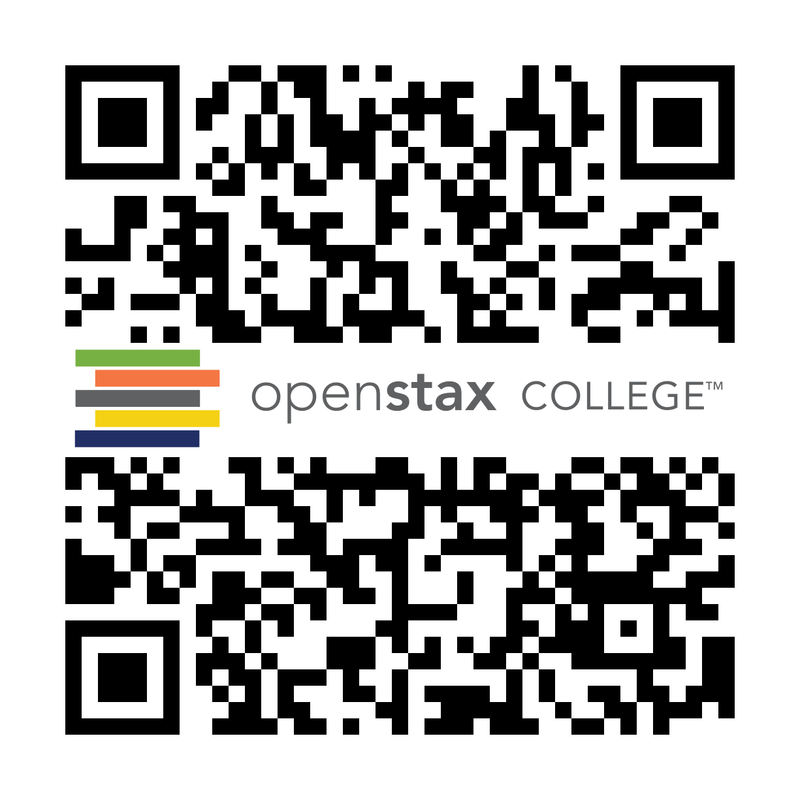 Biology by OpenStax is licensed under CC BY 4.0. Modified from the original by Matthew R. Fisher.